As Gallit answered in a tweet, our primary focus in The Genius Hour Guidebook is on the middle grades. Q: I also teach at a high school. Could I try this there, too? Yes, definitely. Many high-school students are participating in extensive Genius Hour projects. Some teachers call this learning Genius Hour and some teachers call these projects some form of Google’s 20% time (20 Time, Google Time, 20% Projects) because they give students one day a week, which usually translates to one class period, or 20% of their time together, to work on their projects. Passion projects in high school typically extend for one semester or the entire school year. Some teachers grade the projects, but many give full credit for the process of learning, because failure in the project is definitely an option, according to Kevin Brookhouser, high school teacher at York School in California and author of The 20Time Project. A popular presentation tool in high schools is the TED-Talk-style presentation. Students present a short, well-polished live presentation explaining their Genius Hour project. The talks are viewed by parents, fellow students, community members, mentors and teachers. Brookhouser’s students in California have created many of these presentations, which have also been summarized and posted on YouTube here, here, and here. Nicholas Provenzano, the Nerdy Teacher, had his students hold their own official TEDx event at Grosse Pointe South High School in Michigan. Besides inspiring other students around the world for their own Genius Hour projects, these exemplary videos are an excellent addition to students’ digital portfolios. High school teacher Valerie Lees has had so much success with Genius Hour at her school that they have even turned it into a locally-developed course at their high school. That means students can literally take “Genius Hour” as a course. How cool is that? In addition to the resources above, Jeff Pierce offered good advice to Christina about accountability and scheduling. Here are a few recent tweets in their conversation. Be sure to read all the tweets in the thread. 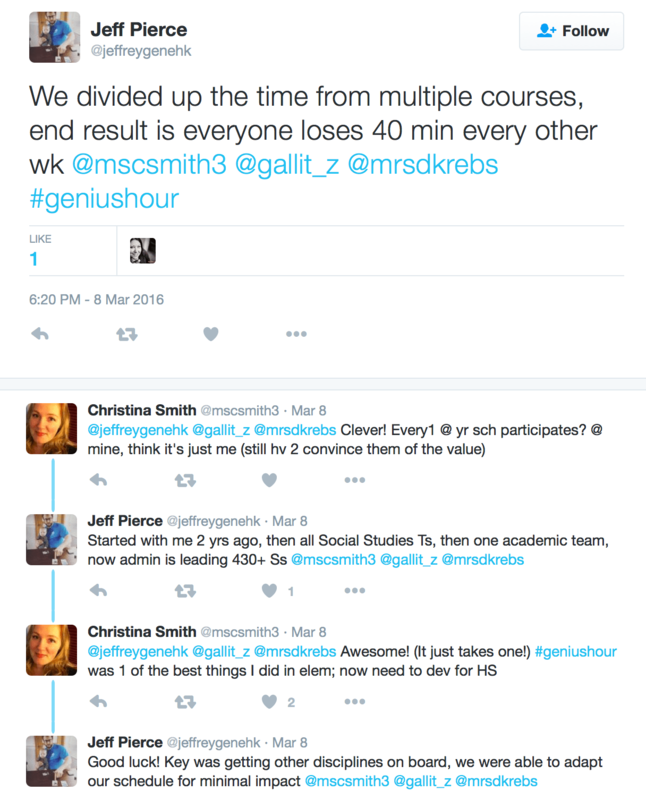 Jeff’s success in convincing his fellow high school teachers to join in Genius Hour is encouraging! Here’s one more great go-to place for help: the Livebinder by Joy Kirr, which includes many high school resources. Please follow the teachers above on Twitter and see what they’re doing with Genius Hour in high school. 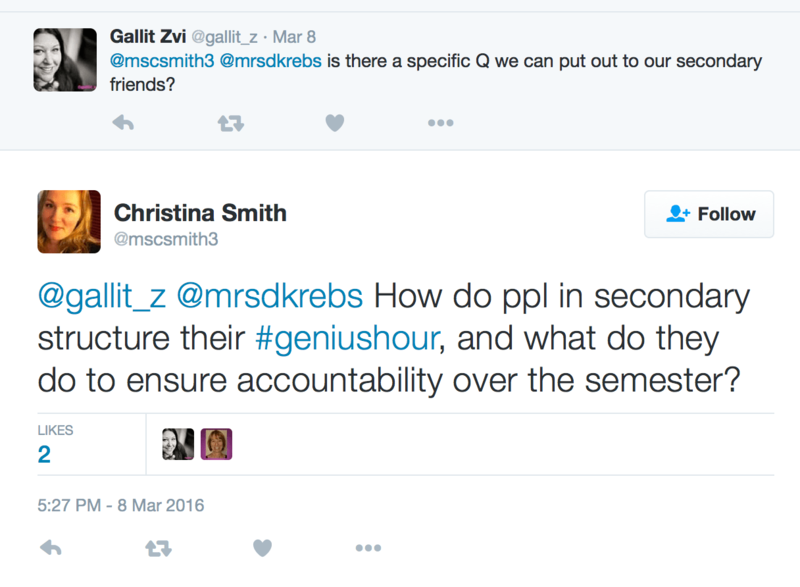 As always, we hope you will leave a comment or question here or use the #geniushour hashtag to join the conversation. We’re happy to discuss high school ideas with you!